Happy holidays from the Neighborhood of Make-Believe! And below is a special invite and the episode descriptions. We’re also happy to provide hi-res art – just say the word! Looking forward to seeing you in the Neighborhood of Make-Believe on December 17th! In “Daniel's Winter Adventure,” Daniel, Dad, Prince Wednesday and Prince Tuesday are all going sledding! But once they get to the hill and see how tall it is, Daniel and Prince Wednesday get scared. Dad assures them that if they try it a little bit at a time, they might surprise themselves and have a great time. Later, Daniel goes ice skating for the first time. When he tries it a little bit at a time, he realizes it is not so hard. 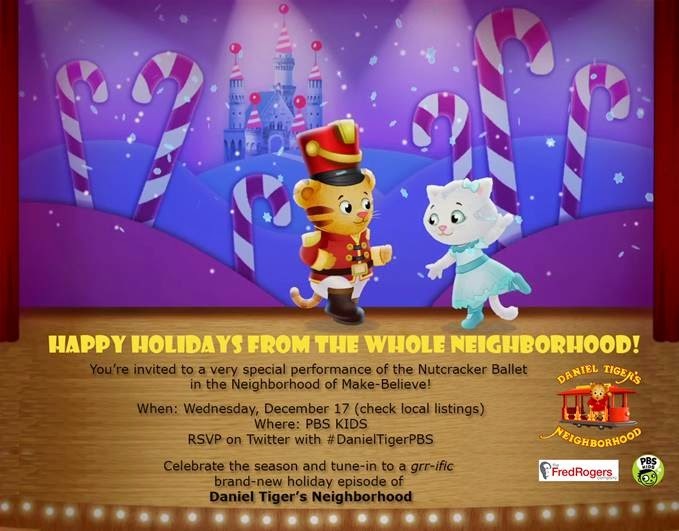 In “Neighborhood Nutcracker,” Daniel is going to see a show called The Nutcracker Ballet! Once he arrives at the performance, he finds out that Prince Wednesday is sick and needs Daniel to fill in for him and dance on stage. Daniel is reluctant at first but realizes that if he learns the steps a little bit at a time, he can dance the Nutcracker and the show will go on! Strategy: If something seems hard to do, try it a little bit at a time.